SOLD is a film adaptation of the globally acclaimed novel by Patricia McCormick, starring starring Gillian Anderson and David Arquette. Based on true stories, SOLD is a story of a girl who is trafficked from her village in Nepal to a brothel in Kolkata, India. Through one girl’s extraordinary journey, SOLD illustrates the brutality of child trafficking which affects millions of children both domestically and globally. ECPAT-USA has partnered with the producers of the movie to bring screenings to your community. The process is simple: by using the service Tugg.com, you can set up a personalized screening in your local theater and raise funds for ECPAT-USA, an organization working to create a world where no child is trafficked or exploited. Not only will the screenings help raise funds for a significant cause, it will be a great opportunity to raise awareness of the issues of human trafficking and sexual exploitation. For more information on how to get started, contact info@ecpatusa.org. If your company is interested in hosting a screening, send us a message and we can make arrangements. More information on SOLD can be found here. 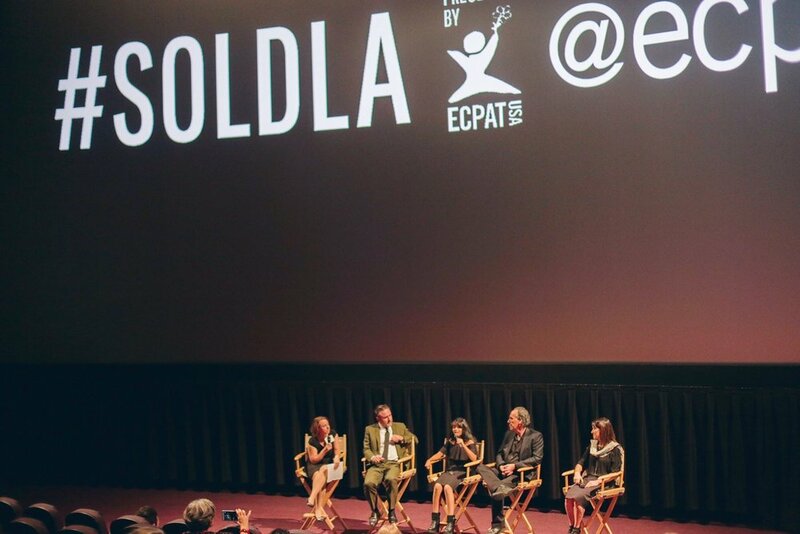 We kicked off 2017 by gathering together with hundreds of supporters and fans at LA LIVE in Los Angeles for a special screening of SOLD, with guest appearances by David Arquette, Niyar Saikia, and the film's producers. Thanks to our generous sponsors who made it all possible: HRS Global Hotel Solutions, The Parking Spot, Delta Air Lines, Marriott International, The Ritz-Carlton, and JW Marriott Los Angeles LA LIVE.